The Circle of Fifths shows the relationships among the twelve tones of the Chromatic Scale, their corresponding key signatures and the associated Major and Minor keys. In lay terms: The Circle of Fifths is a music theory diagram for finding the key of a song, transposing songs to different keys, composing new songs and understanding key signatures, scales, and modes. The Circle Of Fifths is used in music theory to represent the relationship between Diatonic Scales. The numbers on the Circle Of Fifths chart show how many sharps or flats the key signature for the scale has. Thus a Major Scale built on A has 3 sharps in its key signature as shown by the Circle of Fifths. All songs have key signatures. Understanding what a key is and what it's signature looks like, is a must to being able to read music and understanding the Circle of Fifths. The Circle of fifths shows how many sharps or flats are in any given key signature. At the top of the Circle Of Fifths Diagram, the key of C has no sharps or flats in its key signature. Starting from the key of C and moving clockwise by ascending fifths, the key of G has one sharp, the key of D has 2 sharps and so on. Starting at C each step clockwise gets a sharp - #. Going counter-clockwise from the top by descending fourths, the key of F has one flat, the key of B♭ has 2 flats, and so on. Starting at C each step counter-clockwise gets a flat -♭. Moving counter-clockwise around the Circle of fifths adds flats to the key signature, and moving clockwise around the Circle of Fifths adds sharps to the key signature. Notice that there are flats after the key name starting on B♭Major going counter clockwise around the Circle of Fifths and sharps starting on F# Major going clockwise around the Circle of Fifths. Try to memorize this fact. You can make it easy to find the next key signature moving clockwise around the Circle of Fifths, by counting up five steps on your fingers. C, D, E, F, and G. G is a 5th up from C and is the next key on the Circle of Fifths. You could start again from that key G to find the next key up. But remember the note you start on counts as one. G, A ,B ,C, D So would be D is the next key signature a fifth up from the key before it. But remember thats only when you go clockwise around the Circle of Fifths to find the next Key or fifth up! When you go counter-clockwise the whole thing turns into the Circle of Fourths. To use your hands to find the next key counter-clockwise start on C and count up 4 steps - C, D, E, F and thats the next key on the Circle of Fourths. Piano has white keys and black keys. If I play only the white keys I am playing in the key of C.
Key of C on Piano. But if I add a black key to the mix then I'm changing keys. I can look at the circle of fifths and find that the key of G for instance has one black key and the black key is a F# so to play in the key of G I can play all the white keys but not the F key I would instead play the F# key. Then I'd be playing in the key of G.
The order of sharps and flats is always the same! The order of sharps and flats is always the same. meaning if you see one sharp in the key signature then that will be a F# and only a F# if there are two sharps they will be F# and C# and if there are 3 sharps they would be F# C# and G# . In order to remember which order that the sharps and flats of a key signature are written, there are several mnemonics that can help: The order of the sharps is Fat Cats Go Dancing At Eds Broiler. From this you can say that if you know the key of E major has four sharps, the mnemonic shows which sharps they are (F#,C#,G#,D#). The mnemonic for flats is 'Boogie Ends And Down Go Cats Fast'. Keys are not considered closely related to each other if they are near each other in the Chromatic Scale (or on a keyboard). What makes two keys "closely related" is having similar key signatures. So the most closely related key to C Major, for example, is A minor, since they have the same key signature (no sharps and no flats). This is where Modes comes into play. The next most closely related keys to C Major would be G Major (or E minor), with one sharp, and F Major (or D minor), with only one flat. 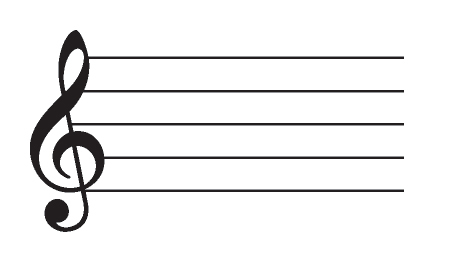 The keys that are most distant from C Major, with six sharps or six flats, are on the opposite side of the circle. Tonal music often modulates by moving between adjacent Keys on the Circle Of Fifths. This is because keys wich discribe Diatonic Scales contain seven pitch classes that are contiguous on the Circle Of Fifths. It follows that Keys a perfect fifth apart share six of their seven notes. and, the notes not held in common differ by only a semitone. Thus modulation by a perfect fifth can be accomplished in a very musical fashion. 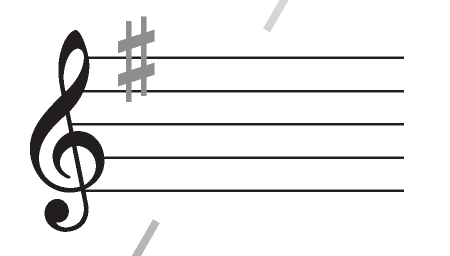 Diatonic Harmony: If we look at The Major Scale in the key of C (white keys on a piano) and we start on the C key and move up a note at a time C, D, E, F, G, A, B, C or we can think of those notes as numbers C=1, D=2, E=3, F=4, G=5, A=6, B=7, C=8 once we think in numbers we can use this Diatonic Harmony chart. 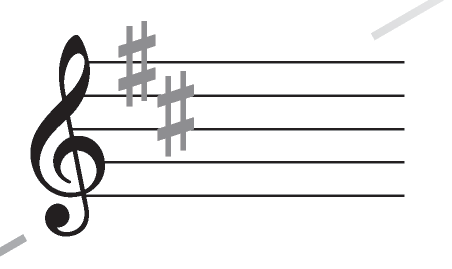 If you hold down key 3 then chances are that the next note you want to press is 6 and then from 6 chances are you would want to move to 2 and so on. Click here to see more info and a video. Transposition with the circle of fifths. The Circle of Fifths can also be used when transposing from a major key to a minor key or vice versa. To do this play the inner or outer circle on the circle of fifths that shares the same key signature. 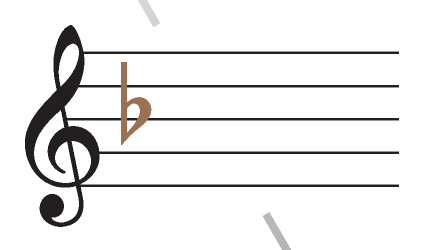 The term interval is used in music theory alot and is the distance between two notes. All music really gets it's feeling by how the intervals are used. There are only seven notes in a scale so all intervals can be made with just seven notes. Think of a piano, if I press two keys at one time anywhere on the keyboard then there is a certan amount of keys between them. The C Major scale on piano it and all scales only have seven notes. The distence between the C and the G key on the piano is known as a perfect fifth interval. Another way to find a perfect fifth on a piano is to start on any key and count seven keys to the right (both black and white) to find a perfect fifth. 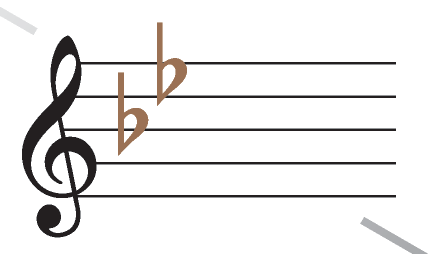 Seven half step is a "perfect fifth", called 'perfect' because it is neither major nor minor, but applies to both major and minor scales and chords, and a 'fifth' because though it is a distance of seven semitones on a keyboard, it is a distance of five steps within a major or minor scale. A simple way to hear the relationship between these notes is by playing them on a piano keyboard. If you traverse the circle of fifths backwards, the notes will feel as though they fall into each other. This aural relationship is what the mathematics describe. Perfect fifths may be justly tuned or tempered. Two notes whose frequencies differ by a ratio of 3:2 make the interval known as a justly tuned perfect fifth. Cascading twelve such fifths does not return to the original pitch class after going round the circle, so the 3:2 ratio may be slightly detuned, or tempered. Temperament allows perfect fifths to cycle, and allows pieces to be transposed, or played in any key on a piano or other fixed-pitch instrument without distorting their harmony. The primary tuning system used for Western (especially keyboard and fretted) instruments today is called twelve-tone equal temperament. The term 'fifth' defines an interval or mathematical ratio which is the closest and most consonant non-octave interval. 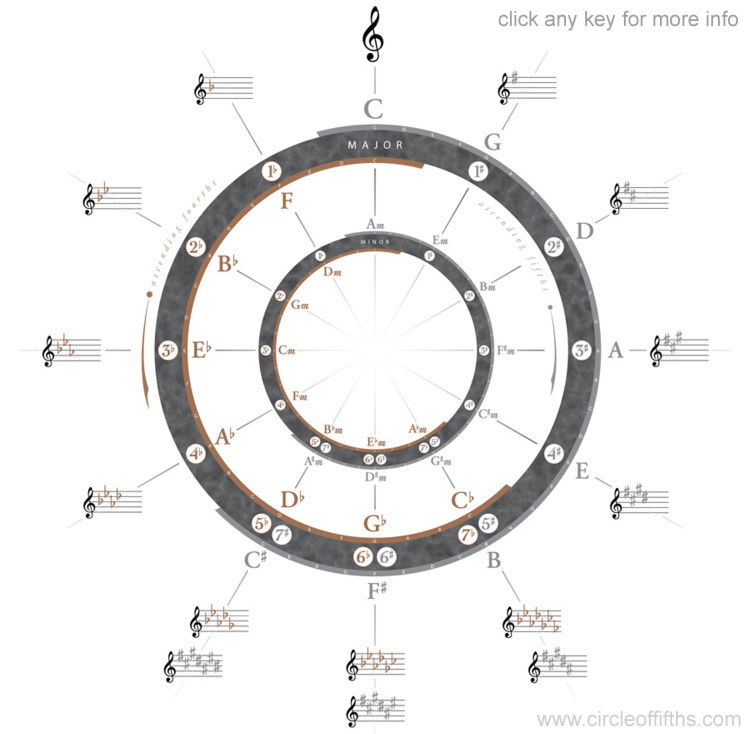 The circle of fifths is a sequence of pitches or key tonalities, represented as a circle, in which the next pitch is found seven semitones higher than the last. Musicians and composers use the circle of fifths to understand and describe the musical relationships among some selection of those pitches. The circle's design is helpful in composing and harmonizing melodies, building chords, and moving to different keys within a composition. 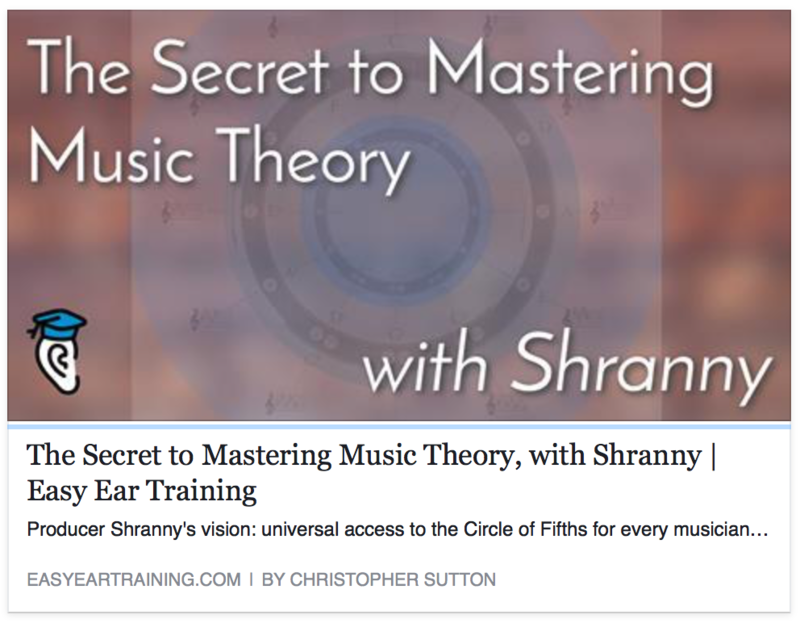 Check out this fast 5 question Circle Of Fifths music theory test.